Introducing our Firenze Collection which features mixed metals with antiqued roping detail. Even the gorgeously faceted Coreana chain adds to the intrigue of this sophisted new piece. Add a Dot from either our silver or gold settings for a burst of color. Love the quality of this necklace and the two-tone gold and silver combination. This has got to be one of the most gorgeous necklaces that Style Dots has come out with. I've been pairing it with the Neutral Twinkle Original Dot that is one of the Dots of the Month for September and the combination is spectacular. Plus the chain is so gorgeous; far prettier in person. You really need to see this one! It should be in every wardrobe. The Firenze Collection goes with everything!!! This look is on trend, I love wearing it with jeans and a t-shirt. Super easy and fun! I love the fact that you can snap in a gold or silver Dot. I just love the chain on this item as it shows off the design. I love this new two-tone necklace. I love the Corena chain and the hammered metal look. This necklace screams class! The two tone goes with everything and I love the chain!!! Love this necklace from the stunning chic chain to the mixed metal, love the hammered design on the outside and the beautiful antiqued rope design. This can be dressed up or down with just the snap of a Dot. The Firenze Necklace is an amazing piece of jewelry blending your gold and silvers together with style! I love the chain on this necklace!! I also like the two-tone. 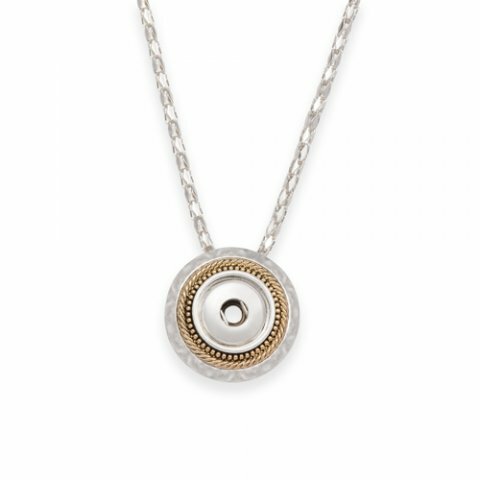 I love the hammered detailing on the Firenze Necklace and the silver and gold combo. The Coreana chain is so beautiful and flexible. This gorgeous necklace will go with anything. I love the Coreana chain on this necklace as it is very durable and strong. My favorite color of Dots to wear with the Firenze necklace are the orange Dots as they really stand out and are perfect for fall. This is a beautiful necklace that is very versatile because of the silver and gold combination. The Coreana chain sparkles in the light and is very lightweight and comfortable to wear. It is especially lovely with the Firenze Dot in it! I love the versatility of this necklace! Great way to mix metals!